The SRAM UK Technical Centre is a joint venture between SRAM and ZyroFisher. The Tech Centre is currently a Trade Only facility - servicing the needs of bike shops and OE manufacturers. At the heart of the Tech Centre vision is the desire to provide first class service and support of SRAM products for Dealers and OEMs. This in turn gives your customers the maximum in customer satisfaction. Being situated in the heart of the Berkshire countryside, the centre is ideally located for road and off-road product experiences. In addition, the centre also has a large showroom and training facilities for Dealer / OEM use. Contact your ZyroFisher Account Manager for more information or to arrange a visit. 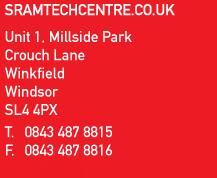 Alternatively you can contact The Tech Centre directly on 0843 487 8815 or by email at info@sramtechcentre.co.uk. The SRAM Tech Centre looks after all Warranty and Service of SRAM, Rockshox, Avid and Truvativ and Zipp branded products. To submit a SRAM Service/Warranty return please click here or on the REQUEST A RETURN link on the left. This will take you through to the login page on the ZyroFisher B2B. Login and go to "My Account > SRAM Warranty online" to register your request as normal. A postage label for the new Tech Centre will be provided with your returns number. The address and the numbers above should be used for all SRAM, Rockshox, Avid and Truvativ service and warranty requests. To request a return please login to the ZyroFisher B2B website www.zyrofisherb2b.co.uk, select My Account then select "SRAM Warranty Online". Please contact the SRAM Tech Centre on 0843 487 8815 to arrange your return. The Tech Centre will provide you with a returns number. Please print off the Returns Label template below and complete the returns number section before affixing to box and returning to the Tech Centre for Service. The SRAM Technical Centre currently only handles requests from Trade partners. If you are a consumer who is looking for help with spares, service or warranty issues, please contact your nearest SRAM stockist or local bike store in the first instance. SRAM stockists can be found at www.zyrofisher.co.uk/retailers/sram.